Just done the update on my Apple TV so that I can now do Mirroring from my iPhone 4S and my iPad2 to the Apple TV. Once the update has been done, double press the home key on your iPhone 4S and iPad 2 and scroll to the left to find the AirPlay symbol. 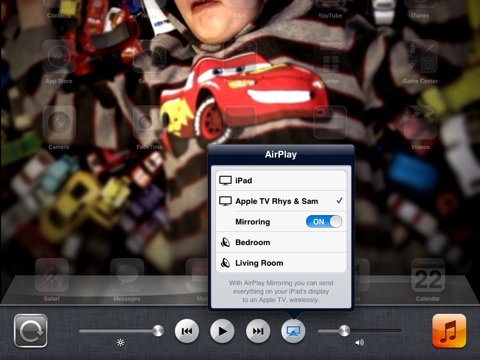 Then select the Apple TV and make sure its switched on. Then what ever shows on your iOS device is on the big screen. The only thing I couldn’t do was stream Films that I had purchased off iTunes! Which doesn’t make any sense, as I can play these through my Apple TV anyway if it is stored on my iMac.